Make sure you have; a Sorc'd account, the Sorc'd browser extension (Chrome I Edge), and the Sorc'd for Outlook add-in. If any of this sounds foreign, click on the links to take an action. Outlook requires that you open add-ins upon each new message. To do this, click on the Open Sorc'd at the top of the Message tab. If you have not installed the Outlook add-in, click here to do so. If you do not see the Add-ins, you may have to customize your toolbar and select the show add-ins check box. 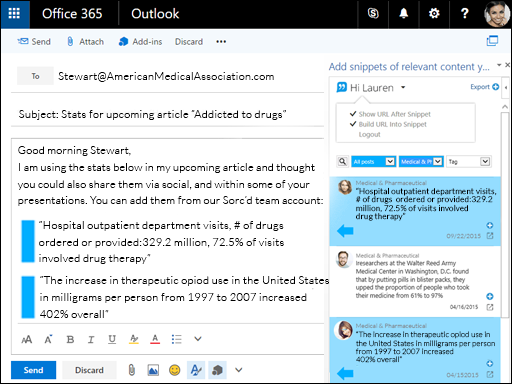 Once the add-in is activated, a task pane on the right-hand side will appear within your Outlook message box. Here you will find all of your Sorc'd snippets. You can filter by post type (team, personal, public or all), category and tag, or simply search for what you are looking for. Click on the “+” sign next to the snippet you want to add. The snippet will be added where your cursor is. You can choose to have the source URL linked or come after the snippet. These settings can be adjusted by clicking on the arrow next to your Sorc'd name.